Hi all, I'm Neil Foreman from UK! As one of only three Vision owners in UK it's easy to feel a little isolated but thanks to the power of the Internet, here I am, chatting like you're all just next-door. 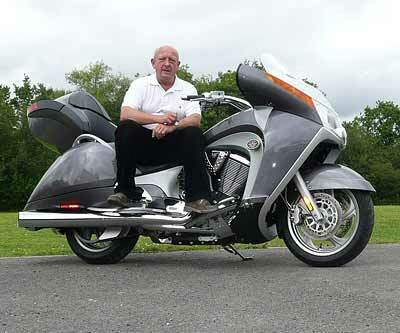 I am now the proud owner of a new Vision Tour Premium; I have to admit to being a born-again-biker having recently returned to two wheels (with an 07 V-Rod) after a break of thirty years. Like everyone else here I was captivated by the thought of owning and riding a Vision so I just had to get me one. I rode a dealer-loaned 5Kmile Vision Street for a few weeks but I collected my own new Grey Tour Premium machine at the end of July after almost eight weeks wait (I was promised three to four maximum, but that's another story). At least I had the loaner to cut my teeth on, for which I'm grateful. It's a fantastic machine and I love almost everything about it but, like many other owners, I recognize that the beast ain't perfect so I've made a few notes of my likes and niggles. As you read my list please don't think that I'm unhappy or disappointed â€“ cuz I'm not. I did enough research to know exactly what I was buying and I've found no nasty surprises to date. I'm just sharing my observations - for what they're worth. Despite the few niggles, it lives up to expectations. Almost forty years ago (in what sometimes feels like a different life) I embarked upon an Engineering apprenticeship with Marconi Avionics (now British Aerospace) where I learned to make things. Those skills have been a mixed blessing both as the foundations of a successful career and business but also as an insatiable desire to take things apart and improve upon them. I'm fortunate to have full machine shop, welding and fabrication facilities so I just can't seem to leave anything alone. From the first sight of a new toy I'm mentally changing things to improve it or personalizing it to suit me better. Although I've reined-in the compulsion in recent years I still can't resist a little fiddling. There will be no dramatic remodeling or engine tuning, just correcting things that squeeze my lemon. Bolt-on is, of course, easiest but I'll get into re-engineering if really necessary. Hence the list below. Improve fit of LH luggage lid. Lower rear suspension. I'm 5' 8" and if my hip is particularly painful I have to tippy toe when I pull up. Replace as many accessible fixings as feasible with stainless steel. Make a replacement cover for the exceedingly crappy plastic one over the front of engine components. Reduce driver's seat width if possible to help ease hip pain problems. Move foot controls further back. Handlebar length. I probably won't get around to this mod, but I've seen some extended handlebars on one of the Victory sites. Having ridden a few hundred miles, I think that grips positioned two inches further back would suit my short arms fine. Maybe Victory will offer longer bars as an option one day. Fit a high level stop light and amber turn lights in the trunk. I still have red turn lamps on the rear. Strictly speaking, that's a no-no on a UK vehicle but I think there's some sort of UK / US mutual import / export agreement that allows it. Two things I haven't mentioned anywhere on these lists are speed and power which, to me, are the most irrelevant criteria. As long as I can keep up with my friends and I'm not holding up traffic on the roads - I'm happy. As a simple observation though, the Vision appears to have nowhere near the torque and power of my V-Rod - Acceleration and top speed are way slower in comparison but then the Vision is a far heavier machine so the power to weight ratio may well be similar. Whatever, the Vision's performance is adequate for my needs. Incidentally, the last real bike I owned (over 30 years ago) was a Bonneville Triton and I've never owned a Harley other than the V-Rod so I'm hardly the power and speed guru.